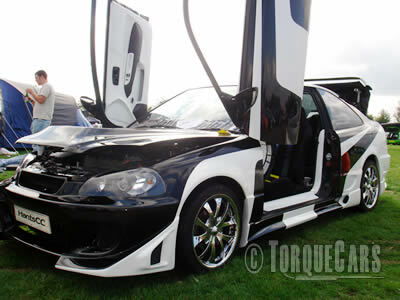 All insurers need to know if a car has been modified. The stats of the insurers generally show that modified cars are involved in more claims, not just accidents but there is a greater likely hood of the car being stolen. There is also the possibility that lower suspension or wider wheels could adversely affect the handling of the car so the model they rated and gave a group to does not apply to your unique vehicle. So an underwriter needs to agree 'terms' of cover. When setting a car insurance premium for a modified car, an insurer will also look at the base car you started from - diesels are favoured over petrol. A £500 car with a £1000 ICE instal and £2000 worth of 20 inch alloy wheels is an obviously increases the risk of the car going 'missing' and most insurers would refuse this unless you agree that they can replace the nicked items with standard parts. When you drive a Group 20 car costing £30,000 and add £2000 of alloy wheels and a £1000 ICE instal they are less likely to impose terms. And if the car already does 0-60 in 4 seconds and you modify it to go 0-60 in 3.7 seconds again there is little weight to the argument of an increased premium. Modified friendly insurers are about and most give excellent terms, this topic crops up frequently in our forum. Give Adrian Flux a call on 0800 198 8998 - TorqueCars members get a 15% discount so make sure you join up first. Many Lloyds syndicates will also be willing to listen and offer you personalised terms. It is certainly worth contacting a large Broker and let him do the searching and negotiating for you. For standard cars the insurance supermarkets give excellent ranges of prices and make shopping around easier but for modified cars you really need to approach insurers on a 1 to 1 basis, why not also ask our members in our forums and find out who they insure with for an idea on where to start.